[158 Pages Report] The Instant Adhesive Market is projected to grow from USD 1.57 Billion in 2017 to USD 2.38 Billion by 2022, at a CAGR of 8.75% during the forecast period. In this study, 2016 has been considered as the base year to estimate the size of the instant adhesives market. The report provides the short-term forecast from 2017 to 2022. It aims at estimating the size and future growth potential of the instant adhesives market across different segments, such as curing process, chemistry, application, and region. Factors such as drivers, restraints, opportunities, and industry-specific challenges influencing the growth of the instant adhesives market have also been studied in this report. The report analyzes the opportunities in the instant adhesives market for stakeholders and presents a competitive landscape of the market. Both top-down and bottom-up approaches have been used to estimate and validate the size of the instant adhesive market and to estimate the sizes of various other dependent submarkets. This research study involved extensive use of secondary sources, directories, and databases, such as Hoovers, Bloomberg, Chemical Weekly, Factiva, and other government associations. Moreover, private websites and company websites have also been used to identify and collect information useful for this technical, market-oriented, and commercial study of the instant adhesives market. After arriving at the total market size, the overall market has been split into several segments and subsegments. 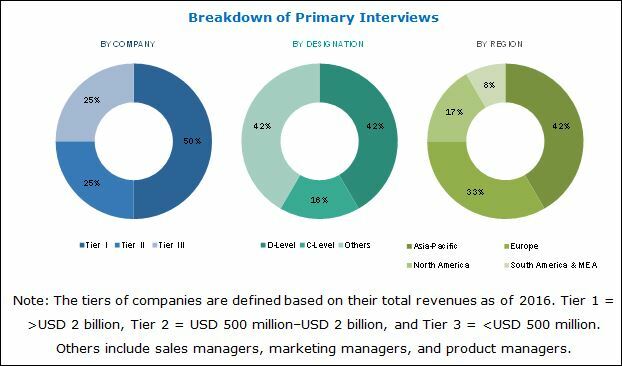 The figure given below provides a breakdown of the primaries conducted during the research study, based on company type, designation, and region. The acrylic adhesives market has a diversified and established ecosystem of upstream players such as raw material suppliers and downstream stakeholders such as manufacturers, vendors, end users, and government organizations. Leading players in the instant adhesives market, which include Henkel AG & Co. KGaA (Germany), H.B. Fuller (U.S.), Huntsman Corporation (U.S.), 3M Company (U.S.), Bostik SA (France), Toagosei Co., Ltd. (Japan), and Pidilite Industries (India), among others, have been profiled in this report. This research report categorizes the instant adhesive market based on curing process, chemistry, application, and region. The market is further analyzed for key countries in each of these regions. The instant adhesives market is projected to reach USD 2.38 Billion by 2022, at a CAGR 8.75% from 2017 to 2022. Instant adhesives are mostly one-part solvent-free adhesives, which cure at room temperature. They offer excellent bonding strength to most of the substrates such as metal, glass, composites, and wood, among others. These adhesives cure instantly when pressed between two similar or different substrates to form a rigid thermoplastic. The market is largely driven by the increased demand from various applications, such as industrial, woodworking, transportation, consumer, medical, and electronics. The growth of the instant adhesives market can also be attributed to the increased investments by key market players to launch efficient and cost-effective products. High growth in the end-use industries of Asia-Pacific and miniaturization and automation in the electronics industry are fueling the demand for instant adhesives. 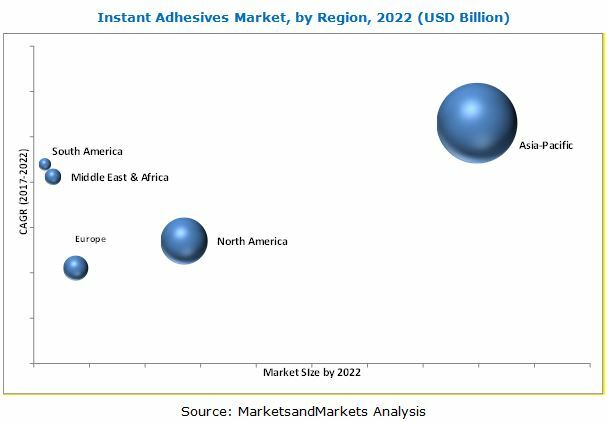 The instant adhesives market has been segmented based on curing process, chemistry, application, and region. The demand for instant adhesives has increased in the recent years in the Asia-Pacific region. This increased demand can be attributed to the growing automotive and electronics industry. This, in turn, has contributed to the growth of the market for instant adhesives in the region. The market is highly competitive as innovative products that comply with tough safety standards and improved efficiencies attract customers. The Asia-Pacific region is the largest market for instant adhesive in terms of both volume and value. Companies such as Henkel AG & Co. KGaA (Germany), H.B. Fuller (U.S.), Huntsman Corporation (U.S.), 3M Company (U.S.), Bostik SA (France), Toagosei Co., Ltd. (Japan), and Pidilite Industries (India), among others, are the key manufacturers of instant adhesives that have expanded their presence across the Asia-Pacific region and enhanced their production capacities to cater the increased demand for instant adhesive from this region. Low durability and high cost of instant adhesives as compared to other types of adhesives are restricting the growth of the global instant adhesives market. Key players operating in the instant adhesive market include Henkel AG & Co. KGaA (Germany), H.B. Fuller (U.S.), Huntsman Corporation (U.S.), 3M Company (U.S.), Bostik SA (France), Toagosei Co., Ltd. (Japan), and Pidilite Industries (India), among others. 13.16 Delo Industrial Adhesives LLC. *Details on Overview, Financials, Product & Services, Strategy, and Developments Might Not Be Captured in Case of Unlisted Companies. Request for detailed methodology, assumptions & how numbers were triangulated. Please share your problem/objectives in greater details so that our analyst can verify if they can solve your problem(s). Please enter your contact details it will help our analyst to reach out to you.